It was a stunning morning weather-wise, crisp, sunny and dry on Saturday, the last run of winter. The start was a good warm-up up the jeep track towards town to link up with the end of the first leg of the Table Mountain Challenge. The on to Heartbreak Hill which was as heartbreaking as ever but the waterfalls were stunning. Followed by a climb almost up to the King's Block House and then from the turnstile it was downhill. Some single track before the boardwalks that lead through the towering trees, passing the still abundant waterfalls and luscious verdant winter forest. The dappled sunlight through the trees and boardwalks was food for the soul. Once past the round table picnic spot, we meandered again on the jeep track towards Constantia Nek, but turned back towards the start. There was a total of 20 runners, with two walkers and six in the recovery group. The main group consisted of only 12 runners - one of whom was a newbie we scooped up on the way! We were lead by the stalwart team of nifty navigators: Geoff, Gregg, Piero and Richard, and there was not one but five fearless sweeps: Dawn, Allison, Theresa, Cathy and Lorraine. Entertainment was provided in the form of interviews with Tom and the scooped-up Boodi. The main group ran 12 km in 2h15. 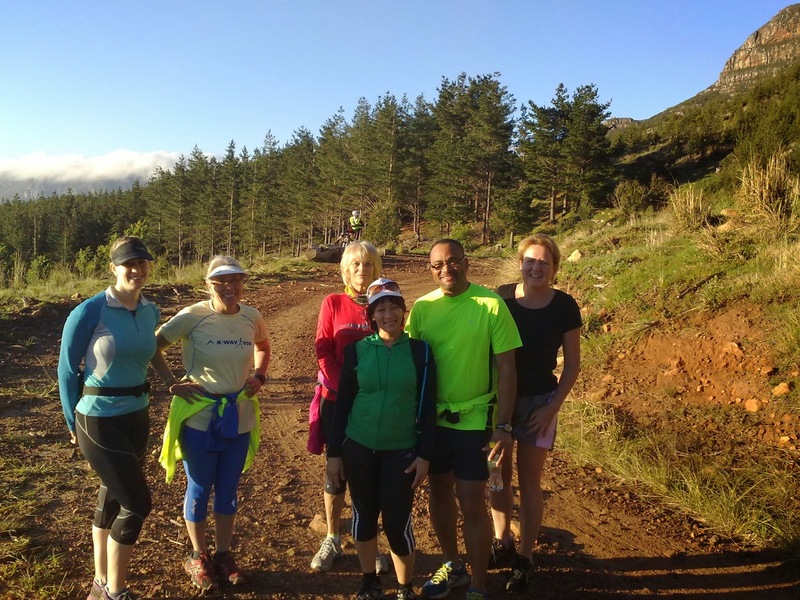 Saturday 23 August was the 4th anniversary run of the Constantia Nek to Kirstenbosch route, and included Veronica Barnes our first recruit. The new tee shirts were handed over to those who had ordered them and from now on our runs will be brightened by trail runners sporting green TMT tees indicating 50 sorties as well as the more familiar red tees indicating 25 sorties. 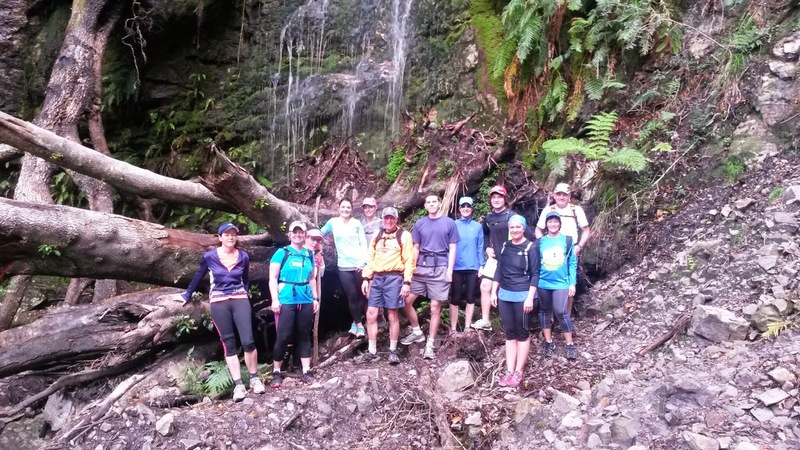 The walking, recovery, and main groups set out from Constantia Nek up the Eagle's Nest shortcut through Cecilia, Spilhaus and Rooikat ravines to the top of Kistenbosch Gardens. 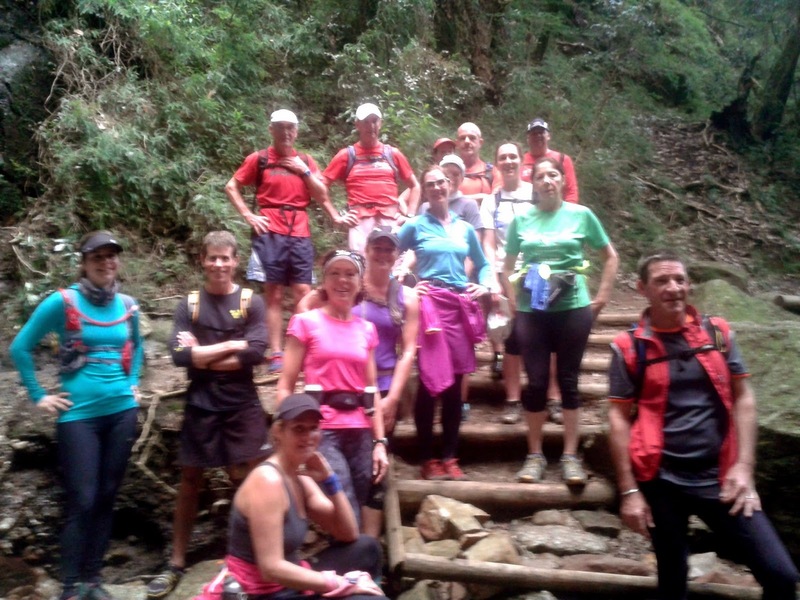 The main group went as far as Skeleton Gorge, the recovery group to Nursery Raving, and the walking group to Fourways. All the groups returned via Cecelia forest and the low route above Rhodes drive back to the start. The main group covered 11.7 km, the recovery group 8 km and the walking group 7.8 km. Except for Richard who collided with a rock and injured his knee forcing him to turn back, all three groups had an uneventful runs/walk. Congratulations to Piero Granelli who completed 50 sorties and our blog editor Nicole Meyer who ran her 25th sortie. 23 turned out on a beautiful late winter/early spring morning with the mountain illuminated by an range glow from the rising sun. 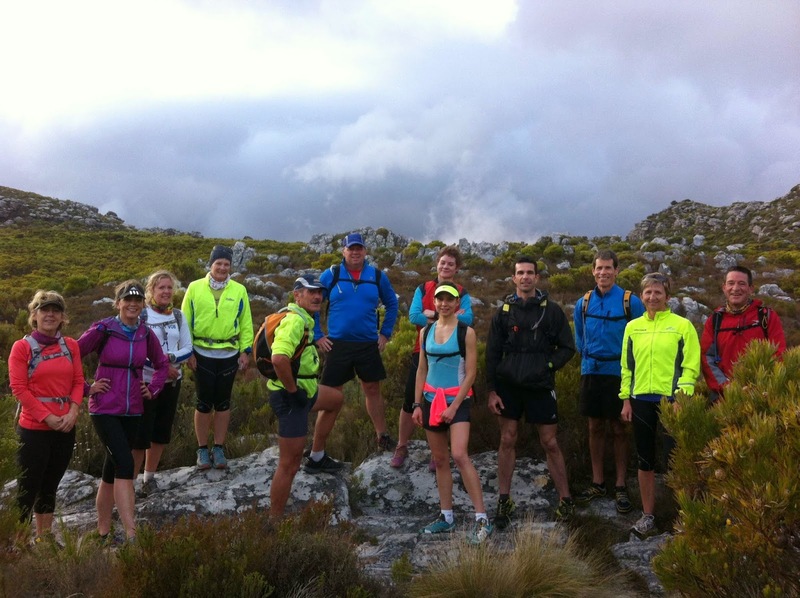 We divided into the customary three groups and Julian and Gregg led off the main group for what turned out to be an almost 17km run along the trails on the flank of Constantiaberg. 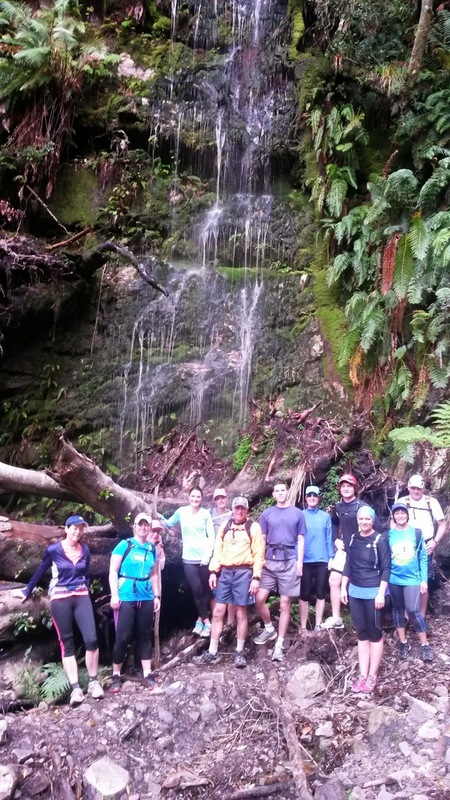 Neil took the recovery group over a shorter route covering 11kms and the walking group also covered 11km. We welcomed back Mike Hart who has been absent for the best part of two years and Leslie Street who had been overseas on business. Twenty-nine pitched up for one of those champagne runs when the weather and company were superb, we ran as a pack at a comfortable pace, nobody got lost or injured, the waterfalls were flowing and we saw a very important bird. Lorraine, a knowledgeable twitcher, spotted the Rameron Pigeon (African Olive), with its distinctive yellow beak and feet, high up in the trees near Constantia Nek. 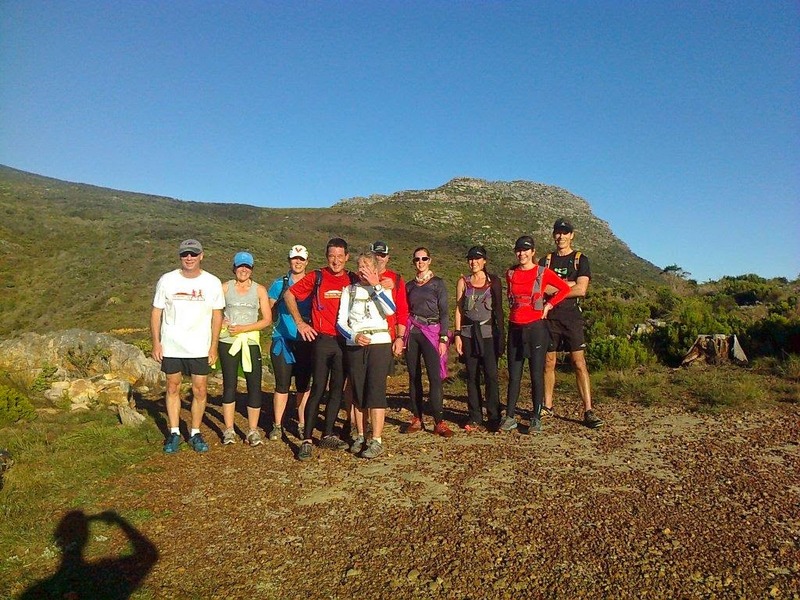 Cellphones came out, lists were ticked and we trotted off back to Cecilia Parking lot after having done a lovely run along the contour path from Cecilia to Skeleton Gorge, up and down Rooikat, past Cecilia waterfall and Spilhaus Ravine. Around 11kms in 1hour and 50 mins for the Main Group and Recovery did 7.1kms in I hour and 40 mins. Thanks to Julian and Richard for leading Main Group, Pierro for making sure we didn’t get lost in his back yard and Gae for sweeping. Thanks to Randolph for leading Recovery and Peter for leading Walkers. 13 Trailers showed up in the semi-dark, pre-storm morning for this Saturday's one-way run along Vlakkenburg. 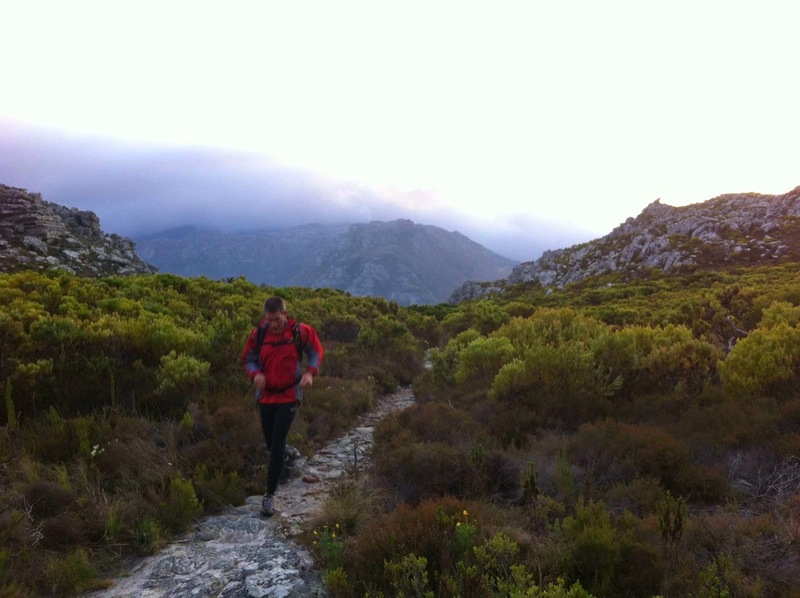 Gregg set a cracking pace up the never-ending Vlakkenburg Neck, stopping at the first of many 'tops of the mountain', to catch our breath, take in the sunrise and for Liz to recover from a bit of dizziness. 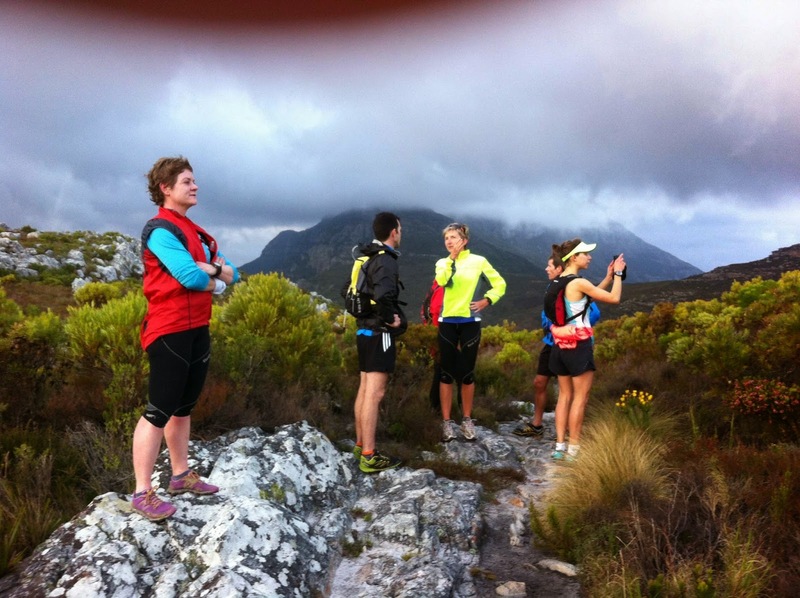 We passed another small group of runners along the single track coming from Silvermine and gave them an update on the weather conditions up ahead. When we got to the second top of the mountain, we were relieved to see the long stretch of downhill. The Manganese Mine being the technical stretch that it is, saw a few people tumble and trip with Beth grazing her knee and Vanessa her finger. Those who had seen enough tops of the mountain, took a short-cut down to East Fort, while the rest continued to the Real top of the mountain. At Blackburn Ravine the faster runners raced down the last stretch to the finish, and we ended up more or less in one piece, dry, exhilarated and ready for breakfast. A total distance of 13 km in 2h 45min.